This was supposed to be a column about picking up paw-paws, a fruit that grows in the wild and which I used to know nothing about other than that they’re featured in the famous children’s song. You know how it goes: Where, oh where, is pretty little Susie?…Way down yonder in the paw-paw patch…Pickin’ up paw-paws, put ‘em in her pocket…Way down yonder in the paw-paw patch. My friend and neighbor Lucy has been out of town for several weeks. Before she left, she invited me to stop by her woods in early September to gather paw-paws. “They’re delicious,” she said. “Like nothing you’ve ever tasted. I hate to miss them.” But when I went to Lucy’s place, bucket in hand, I didn’t spot a single paw-paw, perhaps because I wasn’t exactly sure what a paw-paw tree, or its fruit, looks like. So much for a column. I leaned that paw-paws are native to the eastern United States and have probably grown on this part of our continent for millions of years. They’re a cousin to tropical plants and have a flavor that combines the taste of banana, mango and pineapple in a creamy, custard-like pulp. 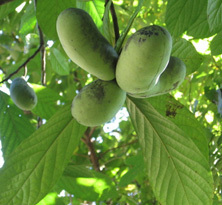 Paw-paws have been popular with several U.S. Presidents. George Washington planted a paw-paw tree at Mount Vernon, Thomas Jefferson planted one at Monticello and, two hundred years later, Barack Obama added a paw-paw tree to the White House grounds. Paw-paws bloom in early spring. I’m told that their maroon blossoms smell like rotted meat, which helps attract the flies that pollinate them. In addition to being a source of food for people and animals, paw-paws serve a vital ecological role as the larval host plant for zebra swallowtail butterflies. So why aren’t the produce aisles of grocery stores and farmers markets bulging with paw-paws this time of year? Because they’re easily bruised and far too perishable to be commercially viable. The best way to experience paw-paws is to pick them up off the ground yourself and eat them immediately. Unless something else gets to them first. That was the heartbreaking conclusion of last weekend’s visit to my friend’s woods. We climbed into his ATV and traveled for more than an hour on miles of rugged trails. And, yes, there were hundreds of paw-paw trees. But not one single paw-paw to put in my pocket. Or my mouth. Apparently the deer, turkey, possums, raccoons, skunks and birds got to them before we did. Perhaps there was even a human thief or two. So it turns out I wasn’t able to write a column about picking up paw-paws after all.